The toddler whose lifeless body on a Mediterranean beach sent shock waves around the world has a name: Aylan Kurdi. Images were published Wednesday of a drowned child — soaked red shirt, blue bottoms and tiny velcro-strap shoes — whose body washed up on the beach in the Turkish resort of Bodrum. The pictures ricocheted across social media — hailed as emblematic of the desperate and deadly refugee struggle to reach Europe — and were plastered on international front pages on Thursday. 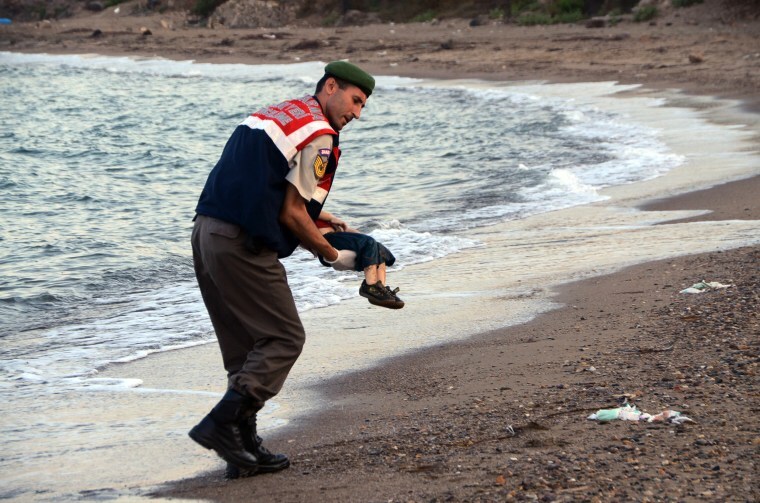 Turkish media and Canada's National Post identified the young victim as 3-year-old Aylan — a Syrian. He died along with his 5-year-old brother Ghalib and mother Rehan while their father survived, according to the Post. The newspaper spoke to the boy's aunt — Tima Kurdi, a Vancouver hairdresser — who confirmed the tragedy. A friend of the family, Mustafa Ebdi, told NBC News he had spoken to the boys' grieving father, Abdullah. Ebdi said Abdullah told him the family was trying to cross to Greece on Tuesday when their boat capsized and that his wife and two of their children — Aylan and Ghalib — had perished. Abdullah survived. The family was from the countryside outside of Syria's city of Kobani, Ebdi added. Abdullah Kurdi collapsed in tears after emerging from a morgue in the city of Mugla near Bodrum on Thursday. "The things that happened to us here, in the country where we took refuge to escape war in our homeland, we want the whole world to see this," Abdullah told reporters, according to Reuters. "We want the world’s attention on us, so that they can prevent the same from happening to others. Let this be the last." Canadian lawmaker Fin Donnelly had been working with the dead boys' aunt to appeal to the country's immigration minister to help the family gain entry, according to the Post. He told NBC News' partner CBC that the deaths were "devastating" for the Kurdi family and underscored the need for more action to aid refugees. "This is horrific," he said. "We need to address this situation." Canada's immigration minister did not immediately respond to NBC News requests for comment.